A Christian wedding is a holy event when God joins two people together. Marriage is a gift from God. The couple asks God to bless their union and trust that God will sustain and nourish them. They also make promises to God and each other about how they will live their lives together. Do I need to belong to Elora United Church? No. We are quite pleased to welcome you and share in this very special event with you, no matter what your faith background is. For us, a wedding is a worship service and weddings done in our church are clearly Christian in character. So we ask you to consider if you can take part in such a worship time with authenticity. 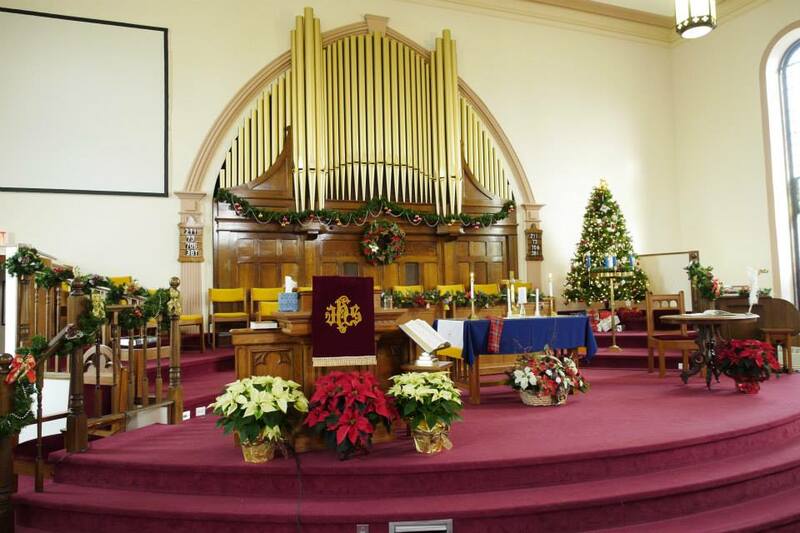 Our church’s worship space, all ready for a Christmas wedding. Do weddings need to happen in the church building? Most of our weddings take place in our worship space. It is a beautiful setting, characterized by an elegant simplicity. Including our balcony, it can seat up to 250. For summer weddings, you need to consider that our building is not air-conditioned. If you want to have your wedding ceremony in another location, please discuss this with the minister. What pre-marriage preparation do we do with the minister? This time is an important opportunity for you to build strong and enduring foundations for your marriage. We want to help your to flourish. So we ask you to take part in our marriage preparation program. Our minister will normally meet with you 3 or 4 times prior to your wedding. He will also lead you through the Prepare marriage preparation course. (If you live a distance from Elora, our minister will help you find a similar program in your area). The basic fee is $750, though that might vary depending on what is involved in the service. This includes pre-marriage preparation, planning the service, the use of our worship space for the rehearsal and wedding, and music. The minister can give you a complete breakdown of costs. Can divorced people get married in your church? Yes! We know very well that human relationships are too often characterized by brokenness. We also celebrate the new life that can arise in the midst of pain and failure. We ask you to consider how wounds from your previous relationship have affected your current relationship. If you have children from a previous relationship, how will your new marriage affect your responsibilities to them? Yes! We are pleased to celebrate the marriage of all couples. To talk about your marriage, please contact our minister, Greg.